Once again, the National Italian American Foundation will return to the elegant and historic Cipriani 42nd Street for its annual New York Gala. This year, NIAF will honor General Counsel, Wilentz, Goldman & Spitzer, P.A. Retired Judge Frank M. Ciuffani; CEO – THE ONE, Lorenzo Zurino; and Senior Managing Director, LeFrak, Marylou Delfino Berk. The evening will be hosted by NIAF celebrity Ambassador and radio show host, Joe Piscopo. 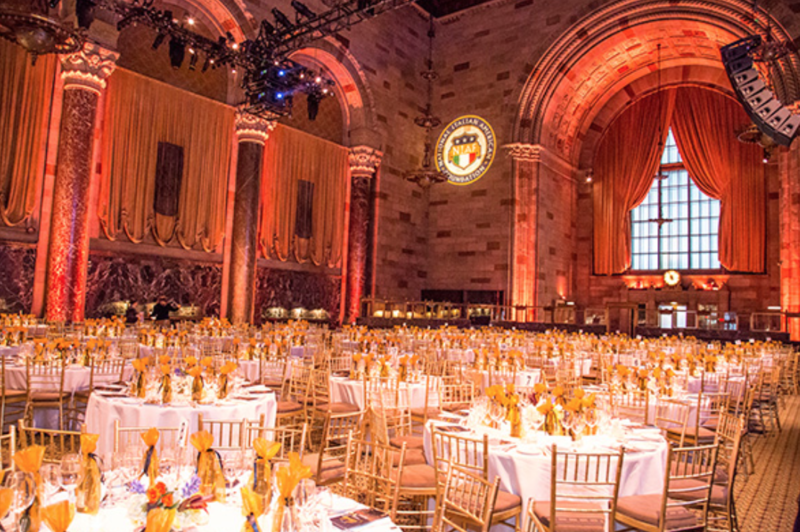 The National Italian American Foundation (NIAF) will host its annual New York Gala at Cipriani 42nd Street on Tuesday, April 9, 2019. This distinguished event, held at the world-famous, historical, New York City venue, will highlight the very best in Italian food, beverage and cultural experiences – as well as celebrate some of the most notable and impactful members of the Italian American community. NIAF is the largest and most faithful representative of over 25 million Italian Americans living in the United States. The Foundation aims to ensure that Italian Americans continue to keep alive and present the rich heritage of their values and cultural traditions, and encourages the Italian American community to preserve and remember the great contribution Italians have made to the history and progress of the United States. This year, NIAF will honor General Counsel, Wilentz, Goldman & Spitzer, P.A. Retired Judge Frank M. Ciuffani; CEO – THE ONE, Lorenzo Zurino; and Senior Managing Director, LeFrak, Marylou Delfino Berk. The evening will be hosted by NIAF celebrity Ambassador and radio show host, Joe Piscopo. The Gala Cocktail Reception will begin at 6:30 p.m. Attendees will move into the principal hall at 7:30 p.m. for Dinner and the Awards Program, featuring entertainment by NIAF Celebrity Ambassador, Joe Piscopo. Attire for the evening is Cocktail. Tickets: $500 (Gold Ticket); $1,000 (Platinum Ticket). Gala Tables and Sponsorships are available through the organization by visiting: www.niaf.org/nyc. NIAF’s New York Gala is chaired by Gerard S. LaRocca, a member of NIAF’s Board of Directors and chief administrative officer, Americas, Barclays Capital. Proceeds from NIAF’s New York Gala will benefit the Foundation’s philanthropic and educational programs.